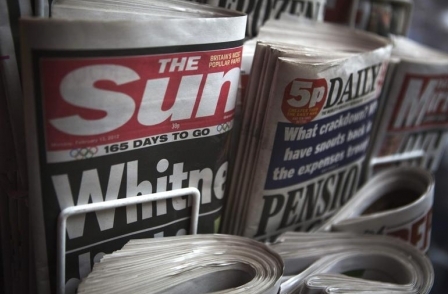 The Sun and the Daily Mirror were the strongest performing newspapers month on month in January, compared with the always weak newspaper sales month of December. The Mirror was up 2.3 per cent to 1,058,488 last month and also reported the second best year-on-year figures, down 5.7 per cent on January 2011. The Sun was the best-performing month-on-month title up 5.8 per cent to 2,409,811, but saw a 12.4 per cent dip year on year as it competes with cut-price sales from a year ago. The Independent's cut-price stablemate i was once again saw the strongest year on year performer, up 20.8 per cent to 293,946 (including 66,000 free bulk copies) . Its sister-title The Independent reported the biggest drop, falling 34.4 per cent on January 2012 (largely do to a decision to switch its bulk sales to the i). The Guardian said it was the only quality daily title that saw a month on month uplift for the third month in a row, with increases in November, December and January. It was up 0.1 per cent to 204,440. Average sales across the daily market were up 2 per cent month on month to 8,486,744 but down 9 per cent year on year. In the Sunday market, (The Sun Sunday up 6.6 per cent month on month to 2,010,826) and the Sunday Mirror (up 1.4 per cent month on month to 1,039,150) were again two of the best performing papers, along with the Mail on Sunday (up 1.7 per cent on December to 1,715,707) and The Sunday Telegraph (up 1.6 per cent to 435,036).